Everyone needs a quick stop at best bakeries in St. Petersburg to recharge and enjoy the best dessert that the city can offer. There are many Things You Need To Taste In Russia, and it does not limit to the culture, people, atmosphere, and landscape only, Russian cuisine is one of the best in the world. Saint Peterburg unlike other big cities in Russia is more laid back and friendly. Things move slower in the city or artistic and cultural hype. People are taking their time enjoying the sceneries and also sipping their cup of tea accompanies by delicious sweet treat in little cute bakeries. Here are some authentic and popular bakeries in Saint Petersburg should you even come in need for some sweet indulgence. 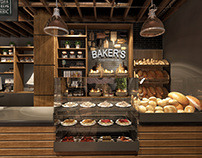 Popular Bakery Shop In Moscow gives different vibes to bakeries in Saint Petersburg. Take for example this quirky cafe serves American sweet delight with a pop or retro interior. The bakeries have had warm welcoming ambiance lure consumer to come and enjoy the day with bright, eclectic and fun vibes. The concept of the place is elevated sweetness not only on the food, snack but also in the drinks options. Their signature milkshake in the tall, foamy glass is the ultimate happiness. The menu also provides some cute and funny names such as Mickey Minaje, Bloody Betty, Chocolate Vendetta, and other thought provoking combinations. Moreover, the sweet treats of various cakes, chocolate, toffee, and many other desserts are a great combination while enjoying an afternoon of tea or coffee. If you are looking for healthier choices in your dessert that consider looking into some of the Healthiest Staple Food Of Russian Cuisine. Russian is a consumer of bringing simple ingredient into a well develop luxury cuisine. Take for example the napoleon cake that uses margarine instead of butter, or the Medolvik Cake that use honey instead of sugar. Russian has been making healthier choice long even before the Soviet Era. This vegan café Botanika display just the right amount of healthy dessert to keep all of their consumers happy. After ten years of opening their cafe door to all Saint Petersburg vegan fanatic, it gains popularity each day. The cafe also introduced amazing Ayurvedic cuisine that highlights healthy eating. This is a place for you if you want to enjoy your dessert without any guilty feeling whatsoever. Classic, retro, fun, fancy, there are many types of bakeries in Saint Petersburg that people can choose from. Waff & Love is a branch shop that serves bubble waffle. It is sprung of a different flavor that offers a wide variety of bubble food and drinks. This cuisine first hit Russia all the way from Hongkong that combine various sweet treats into one bowl. It is definitely not your common Most Served Dessert In Russian Restaurants. Which is the more reason why this cafe is so popular. The menu serves a total over 30 bubbles on top of sweet topping by the consumers’ choices. You can add cheese, chocolate sprinkles, snickers, oreo, chocolate, marshmallow, and many more. Do not forget to add an extra sweetness of whipped cream, ice creams, Nutella, and a variety of fruits. Fancy restaurant and bar scattered in Saint Petersburg that is just very welcoming. If you are looking for a fine restaurant with an artistic feature than this place is the go-to destination. Russia is always famous for its classical charm. Moreover, Saint Petersburg is the utmost highest representation of the classical city in all Russia. Therefore, coming to one of the many bakery shops in saint Petersburg can surprise you. Russian dessert is famous for a little bitter that takes a remarkably long time to make. Therefore, what better way to skip the long hour of making your own cake than just coming here. It serves undeniably authentic Russian cuisine, especially on their dessert menu. The chefs at CoCoCo stay true to the basic principle of Russian dessert contemporary concept, which is simply beautiful deliciousness. There are so many desserts out there, that take sweetness to a whole different level. Chocolate, Cakes, Scones, Gelato, Ice Cream, Waffles are just a few of small treat that you can spot in any bakeries in Saint Petersburg. Di Neve Cafe represents Italian dessert in Russia. It is best known for its various kind of gelato and also a wide range variety of sorbet are just waiting to taste. Due to their unique taste, fflavor and shop, this shop is always full of people waiting in line ordering in. Modern Sait Petersburg is noticing some modern minimalist shop that is just clean sleek and minimalist. The Radosti coffee shop offers some great selection of desserts and a great view overseeing The Neva River. The famous river that separates the two areas of Saint Petersburg. The cafe is not only portrayed a classic modern feature but also making sure that everything in on point. The winner in this place is not just the food, drinks, and hospitality but also the gorgeous scenery that lies in front of them. The warm atmosphere makes the place amazing for studying, working, or just hanging out with friends during a coffee break. The crowded street Nevsky Prospect is a part of Saint Petersburg that is full of people, and tourist at the same time. Many just strolling down the street enjoying the view and the weather. One of the most legendary places to have a dessert in St Petersburg is Sever. The place gains quiet well responds both from the local and tourist. Many Russian grow up with the real Russian dessert flavors from this bakery shop. Russia is more than familiar with seeing bread in their table either for breakfast, lunch or dinner. Moreover, even Bread In Russia Culture has a long history that defines the true Russia. However, it takes some times even in a big city such as Saint Petersburg to embrace artistic bakery that highlight bread and all of its variation. You can easily find bakeries shop all around Saint Petersburg that either serve authentic Russian dessert or have some kind of influence from other countries baking style.